I have published a how-to manual for getting started in managing and overcome anxiety. We will use this type of information in our work together. 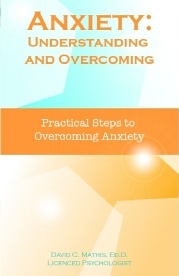 You can obtain a copy prior to your first visit to assist with learning about how we are going to address your anxiety. You can purchase an ebook for $2.99 by following this link on Amazon.com Or, a paperback a copy by following this link on Amazon.com.